First of all,the recipe for stuffed vegetables is rarely an exact science! Inevitably, as the actual vegetables vary in size, you often end up with extra ‘stuffing’ or one or two too many vegetables! I’ve done my best to give an indication of the relevant amounts of both. First of all prepare your vegetables. Carefully slice across the top quarter of the peppers, so that you have a lid. Set them to one side. Now you need to do a similar thing with the tomatoes. You can slice the top off the tomatoes in a similar way, again so you have a lid. I have noticed that in some ‘tavernés,’ the cooks turn the tomatoes upside down and cut out a smaller circle from the bottom of the tomato for the lid. I think this works better and the tomatoes keep there shape when cooking. Carefully, without piercing the outer skin, scoop out the juice and pulp from the inside of the tomatoes into a bowl. Discard the seeds though. Sprinkle the inside of the tomato ‘shells’ with salt and put them upside down on a tray – this helps them loose some of the water and keeps them firm. Using a sharp thin knife, cut the stalk end off the courgettes and, using the tip of the knife cut out the flesh of the courgettes – again keeping the skins intact – put to the side. Finely chop the removed courgette pulp and put to one side. In a pan on the hob, heat about 3 tabs of olive oil, add the chopped onion and fry until it starts to turn slightly brown. Add the mince and fry for a few minutes. Add the chopped courgette pulp and again fry for a few minutes. Now add the tomato juice and reserved tomato pulp, chopped parsley and salt and pepper to taste. Simmer for about half an hour until the mince has cooked and the liquid has reduced slightly. In another pan put the rice to boil for about 5 -10 minutes – it needs to be half cooked. Drain and put to one side. When the meat mixture has cooked, add the drained rice, mix well and cook for a couple of minutes. This is your stuffing and it needs to be fairly dry in consistency. Taste it and adjust the seasoning if required. 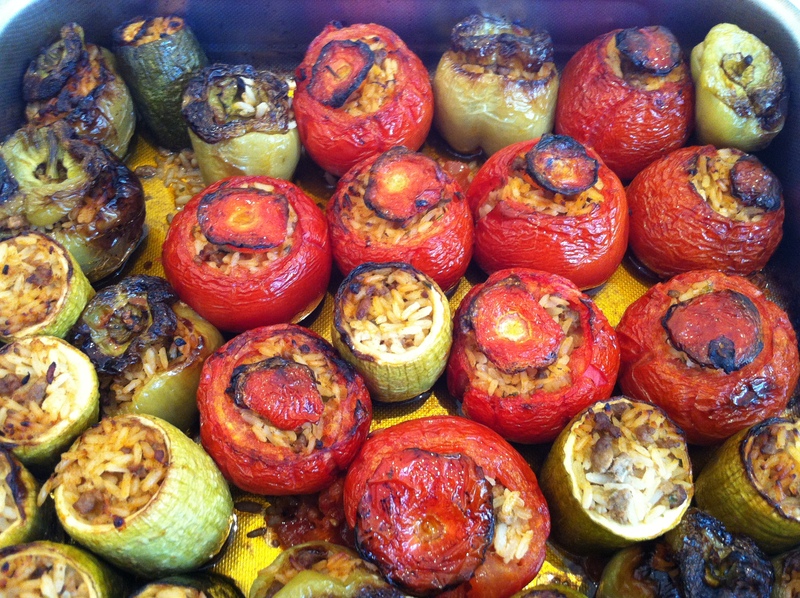 Now take a good sized oven proof dish – a roasting tin is best – and put in it the tomatoes, peppers and courgettes. Give them a good drizzle of olive oil and, with your hands, make sure each vegetable has a good coating, inside and out. One by one carefully fill each of the vegetable ‘shells’ with a few teaspoonfuls of the stuffing – don’t over-fill them as the rice will swell during the cooking. This is especially important with the courgettes, as you don’t want the stuffing to fall out! Put the lids on the tomatoes and peppers. Put the potato wedges into the roasting tin too. Drizzle generously with olive oil and also a few splashes of water. Bake in the oven at about 180 – 190 degrees for approximately 40-50 minutes, basting them occasionally with the pan juices. You may need to add a little water so that the juices don’t dry up.